Watchman or Peon jobs. Total 215 vacancies are in this Malegaon Municipal corporation jobs. Eligible candidates attend the walk in interview as per given dates of 04-10-2018 and 05-10-2018. Candidates must be within the age limits of 18-38 years and for reserved candidate 18-43 years. Candidates will be selected through walk in interview only for this Malegaon Municipal Corporation Vacancies. For fireman posts physical tests will be conducted. These vacancies are purely contract basis only. 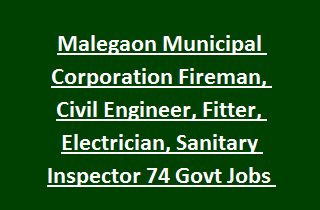 For more details about this Malegaon Municipal Corporation Recruitment of Fireman, Sanitary Inspector, Driver, Watchman and other vacancy information is given below. There is total 74 vacancies in this Malegaon MC Recruitment Notification 2018. Post wise vacancies, walk in interview dates are given below. As walk in interview date candidate candidates age limit will be 18-38 years and for reserved candidates 5 years of upper age relaxation is applicable. Candidates will be selected based on their performance in personal interview. Preference will be given merit having candidates. For Fireman Jobs Physical tests will be conducted. Interested and eligible criteria having candidates may attend the walk in interview as per given dates along with all original documents and two sets of self attested copies. For more details refer official notification for Malegaon MC Recruitment 2018.